I don't understand drinking decaf coffee. It's like non-alcoholic beer. Both are crappy, neutered versions of the original. But if you've absolutely got to drink decaf, D+caf will make sure it's the real (fake) deal. 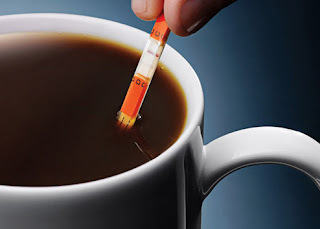 D+caf test strips are simply little strips of paper coated with antibodies that tell if you a beverage is properly decaffeinated, turning up blue lines if it's got more than 20mg of caffeine per 6oz serving. Even modern decaffeination procedures can't remove every single trace of caffeine, but between 20 and 30 percent of coffee and tea drinks "contain unacceptably high levels of caffeine" according to the strip's maker, Silver Lakes Research. The strips are 98 percent accurate for detecting caffeine, plus you have to use them before you add anything else to your coffee tea, like milk or sugar. And at $10 for a pack of 20, you're paying 50 cents a strip, instantly propelling even cheap decaf coffee into Starbucks pricing territory. So I'm not sure these are worth the small bit of security that some smartass doesn't occasionally slip you real coffee instead of decaf.